Castles had gatehouses to protect the entrance, which was the weakest point. The gatehouse itself had lots of defences. Since the castle was surrounded by a ditch or moat, a bridge was needed across the gap. There were three types of drawbridge. The simplest type was the best known, the lifting bridge which pivoted at one end in the gateway, lifted by chains. The chains passed through slots in the wall to windlasses in the gatehouse. The disadvantage with this was the time it took to raise the drawbridge if there was an attack. The second type solved the problem by pivoting in the middle, with a pit in the gateway for the weighted end to drop into, while the far end rose into the air. In an attack the lock was released and the bridge fell open. 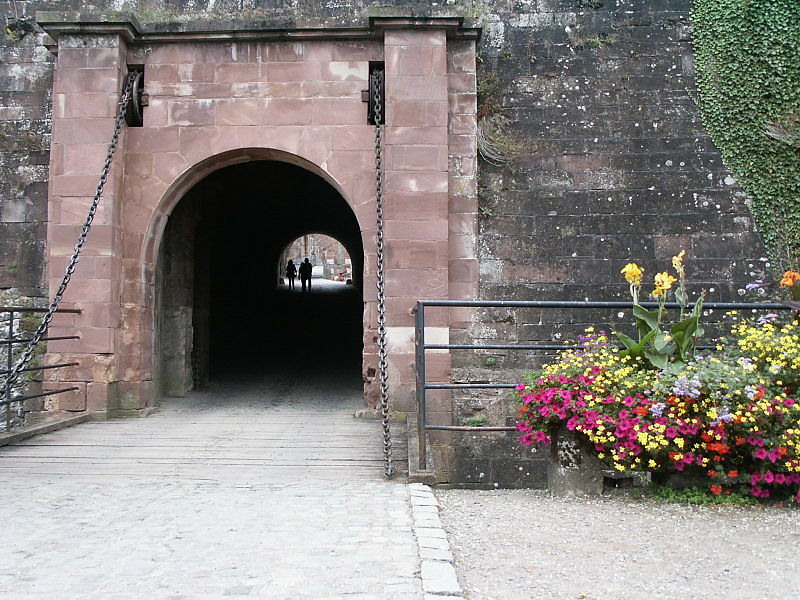 From about 1300 a third type of drawbridge became popular. It used a counterbalanced beam that pivoted above the entrance. The inner section was weighted and the outer section was joined to the drawbridge by a chain. As the inner section lowered, the outer section raised the drawbridge. Much quicker and less effort than a winch. 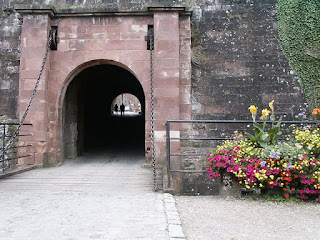 Behind the drawbridge was a portcullis, sometimes two, with one further down the gatehouse passage. So behind the drawbridge winch above the gate, was another winch for raising and lowering the portcullis. 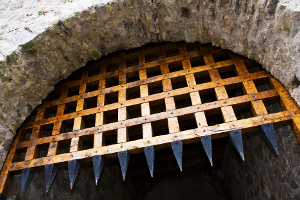 Like the pivoting drawbridge, it could be lowered instantly, splitting the attackers into those who made it through and those outside, impaling any unlucky ones caught underneath. Portcullises were made of wood covered in iron, to make it last longer and protect against fire. It was made to fit exactly into the slots in the gatehouse wall and actually built in as the gatehouse was constructed. These were holes in the ceiling of the gatehouse passage through which attackers could be attacked. Arrows, stones, boiling water or oil, even fire could be rained down on the people trapped in the passage, especially where there were two portcullises holding them in between. There was also a water chute in case of fire. In peacetime the holes were useful for handing supplies up into the gatehouse.